The LASER pushbutton is used to select between incrementing (red light on) and decrementing (red light off) an adjusted parameter. To enter the adjustment mode, hold the BLACK BUTTON down while powering up the unit. Note that the needle positioner speed adjustment will change parameters that affect the needle top position and the constant speed range, so it should be performed first. Push and hold down . A needle positioning step (up or down) will be made. If the speed and strength are sufficient, release , the adjustment is completed. If the speed and strength are not sufficient, while still holding down, turn off the red LASER light if the speed needs to be decreased, turn it on if increasing is necessary. While still holding down, hit . A beep will indicate that the speed was increased/decreased and the new value was stored in the computer's memory. A missing beep indicates that a high/low limit was reached. Release and repeat the procedure from Step 2 until the desired speed is reached. With the SELECTOR DIAL still at the minimum (B1) position push and hold down . A fast single stitch will be made. Check the speed of the stitch. The speed should as high as possible without causing double stitching. If the speed is acceptable, release , the adjustment is completed. If the speed is not acceptable, while still holding down, turn off the red LASER light if the speed needs to be decreased, turn it on if increasing is necessary. While still holding down hit . A beep will indicate that the speed was increased/decreased and the new value was stored in the computer's memory. A missing beep indicates that a high/low limit was reached. Release and repeat the procedure from Step 1 until the desired speed is reached. A major improvement in the REV2.0 software makes it possible to eliminate the mechanical timing and set the regulated stitch return position by software, similarly to the needle up/down positions. While watching the green light above the DOWN button turn the handwheel to the right direction very slowly until the light comes on. If the light just flashes, turn the handwheel backward until the light is on again. With fine adjustments of the handwheel the green light can be constantly turned on. If the green light stays on when the point of needle is just touches the fabric on its way down, the timing is correct, you can proceed to the UP/DOWN POSITON ADJUSTMENT. If the green light is turned on when the needle is not at the desired position, the SENSOR ALIGNMENT procedure should be followed. The needle position sensor is placed on the rear shaft of the motor. The sensor is mounted on a bracket by a 1/2" nut (a). Turn the handwheel to the right direction until the needle just touches the fabric on its way down. Loosen up the nut holding the sensor and turn the sensor very slowly watching the green light above the DOWN button. If the light just flashes, turn the sensor backward until the light is on again. With fine adjustments of the sensor the green light can be constantly turned on. When the green light stays on the sensor is aligned properly. Tighten the mounting nut. Replace the cover on the needle position sensor. When adjusting the "up" position, the take-up lever should be at this position to release the thread from the hook. When adjusting the "down" position, the needle should stop at its lowest position. If the up(down) position is correct, release , and go to Step 1 to check the other position. 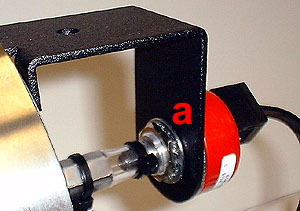 If the up(down) position is not acceptable, turn on the red LASER light if the handwheel needs to be turned counter clockwise, turn off the light if the handwheel needs to be turned clockwise to reach the desired up (down) position. While still holding down hit . A beep will indicate that the new position was stored in the computer's memory. Release and repeat the procedure until the desired needle positions are reached. Note that in some cases excessive overrun and occasional double stitching may occur during the up/down position adjustment. This may be due to unnecessary high needle positioner speed. In such cases a repeated needle positioner speed adjustment is necessary to eliminate the effect. With the SELECTOR DIAL still at the 12 o'clock position push and hold down . A fast single stitch will be made. Check the needle return position. The needle should return to the top position with the take-up lever at the depicted position. If the needle return position is correct, release , the adjustment is completed. If the position is not acceptable, turn on the red LASER light if the handwheel needs to be turned counter clockwise, turn off the light if the handwheel needs to be turned clockwise to reach the desired needle return position. Release and repeat the procedure until the desired needle return position is reached. Note that in some cases double stitching may occur during the needle return position adjustment. This may indicate that the sensor is out of alignment. In such cases a repeated sensor alignment is necessary to eliminate the effect. Turn the SELECTOR DIAL to its maximum (100%) position. Push and hold down . A reduced speed (precision) single stitch will be made. With the SELECTOR DIAL still at its maximum (100%) position push and hold down . The motor will start running continuously with the fastest constant speed. Check the full speed range by turning the SELECTOR dial while holding down. Note that should be held down continuously during the whole procedure. If the maximum speed needs adjustment, while still holding down, turn off the red LASER light if the speed needs to be decreased, turn it on if increasing is necessary. While still holding down hit . A beep will indicate that the speed was increased/decreased. Repeat the procedure from Step 2 until the desired maximum speed is reached. While still holding down turn the SELECTOR DIAL to its minimum (B1) position. This is the slowest speed. If the slowest speed needs adjustment, while still holding down, turn off the red LASER light if the speed needs to be decreased, turn it on if increasing is necessary. While still holding down hit . A beep will indicate that the speed was increased/decreased. Repeat the procedure from Step 7 until the desired slowest speed is reached. When both the slowest and maximum speed are acceptable release to save the adjusted speed range in the computer's memory.